TOKYO (AP) — As a brass band blared “Anchors Aweigh,” Tokyo’s governor led Thursday’s opening ceremony for the Japanese capital’s new fish market and tried to assuage concerns about contamination at the site that delayed the move from the famed Tsukiji market. 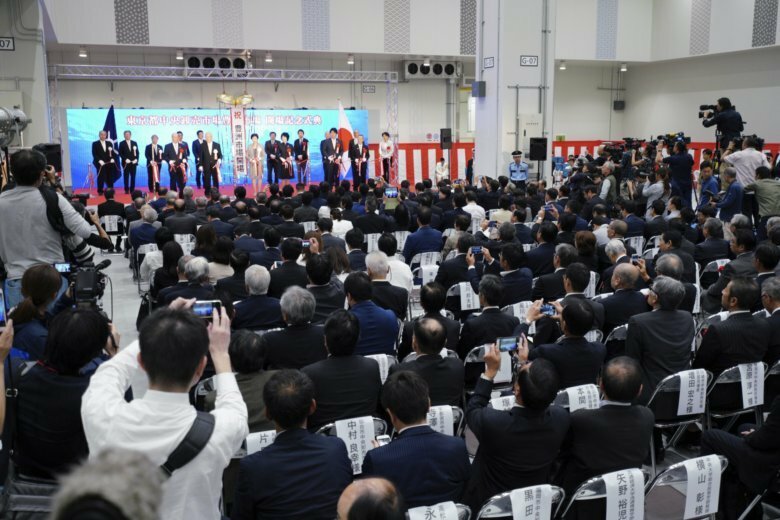 The new Toyosu market won’t open for business until Oct. 11, but hundreds of government and fisheries industry officials in dark suits came to the ribbon-cutting ceremony at the sprawling facility. Wholesale fish sales will end at Tsukiji, which opened in 1935 and became one of the city’s most popular tourist attractions. After taking a tour of the new facility, Tokyo Gov. Yuriko Koike told the crowd that Toyosu will carry on the “Tsukiji brand,” which represents a food culture loved around the world. Koike delayed the move scheduled for November 2016 after an inspection found arsenic and other contaminants in the groundwater at the site. Tsukiji became a favorite tourist spot for its array of tiny sushi restaurants, shops selling Japanese knives and stalls hawking hundreds of species of seafood as well as sweets. Yet it is also a working market, where an average of 1.6 billion yen, or about $14.5 million, worth of seafood is moved each day. This weekend will be the last time its iconic early morning auction will open for visitors. The city’s plan calls for a new mall-like facility for Tsukiji, including a theme park. Some of the stores and restaurants in the area surrounding Tsukiji’s wholesale market and auction area will stay, but its core fish market operations are moving to Toyosu. Officials hope the new state-of-the-art market at Toyosu will also become a tourist attraction. The move to Toyusu has been unpopular from the start because an earlier plan envisioned keeping the fish market in Tsukiji by modernizing the facility with construction while it continued to operate. Tsukiji is closer to central Tokyo. The city under Koike’s predecessors decided an updated facility was needed for sanitation and efficiency reasons. The proposal was damaged by the discovery of contaminants in the new site, and some critics have said consumer confidence can’t be restored, despite assurances that the new facility has since been made safe. Almost every speaker at Thursday’s opening ceremony talked about how long the struggle had been for the move, including wrangling among city lawmakers. Takaaki Yamazaki, the head of Koto Ward, where Toyosu is located, used the Japanese expression for moving beyond the past with water, to welcome the new market. “Let’s wash all that away and let bygones be bygones,” he said.